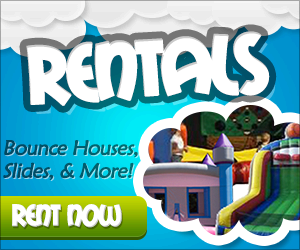 1) Our rental inventory includes inflatable bounce houses, slides, combo units, obstacle courses, and more! Check out our inventory and prices below! 2) Inflatables are delivered, set up and picked up by the All Bounce Events & Rentals delivery team. 3) Inflatables are cleaned and sanitized before each use. 4) Inflatables are one set price for rental time of up to 8 hours! We do not price per hour. 5) Delivery to all of Knox County is FREE; however, we do deliver outside of Knox County! Please email us at allbounceevents@gmail.com for delivery pricing outside of Knox County. 6) We can set up indoors or outdoors! We can set up on almost any surface, including asphalt and concrete. We cannot set up on gravel or other rocky surfaces that may damage the bottom of each inflatable. When reserving an inflatable for an indoor space such as a gym or rec hall, please make sure that our inflatables can fit (length, width and height) in the allowable space. Inflatable measurements can be seen on every Units Description as you shop and choose. 7) Special rates are available for non-profits and churches! Email us at allbounceevents@gmail.com for more information. 8) A $50 deposit reserves your inflatable rental! The remaining balance for your rental will not be due until we deliver the inflatable. Please Note: The $50 deposit is a non-refundable deposit unless cancellation needs to be made due to inclement weather. 9) Refer to our Frequently Asked Questions page or give us a call at (865) 407-0111 for additional information on any of our inflatables! Ready to book?! It's EASY! Click below!